Travel with Kevin and Ruth! : Our Namibia trip just got better! With many thanks to our facebook fans, we're thrilled to announce that we are one of three winners of another contest! 25 nights of accommodation and breakfast at any of the lodges that belong to the Gondwana Collection Namibia. It is because of our facebook fans that we are going to Namibia in the first place. You all helped us win a contest sponsored by the Namibia Tourism Board. Then, we asked if you would want to help us again, and many of you did just that! Have we mentioned that we have the best facebook fans ever??! 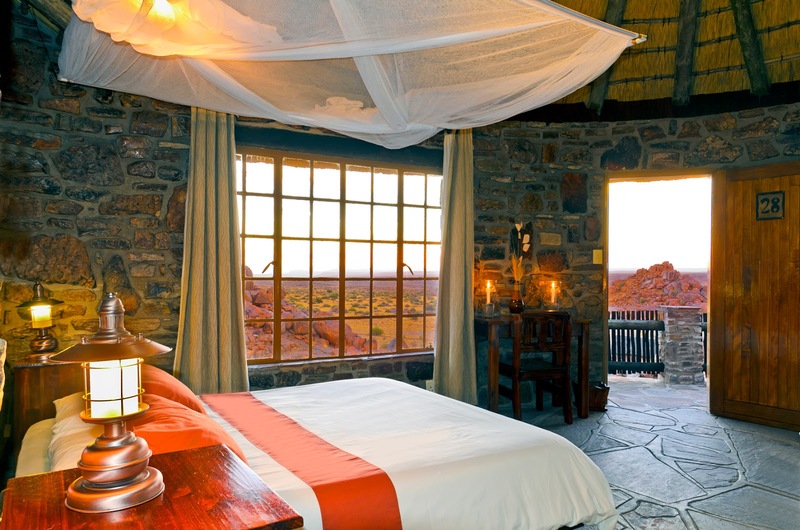 The Gondwana Collection in Namibia operates a group of around 20 lodges, campsites, and restaurants spread across the country. This prize will be great for us, although there will be some logistics involved. One of the rooms at the Canyon Lodge. Photo courtesy of Gondwana Collection Namibia. When we arrive in Windhoek, Namibia, we will be picking up our rental 4x4 with all of the camping gear. During our 24 night camping adventure, we are already booked at a few of the Gondwana Collection campgrounds. Our schedule is put together as part of our prize from the Namibian Tourism Board. But of course when that is over, we will have to return the vehicle. We'll be staying on in Namibia for another month or so after that. But we likely won't have access to a vehicle, and the Gondwana Lodges are spread out across the country and it may not be that easy to take public transportation to get to the lodges. I actually haven't looked into the possibilities of that yet. But we'll figure something out! One of the Eagle's Nest Chalets belonging to the Gondwana Collection. The second thing that we'll have to figure out is meals. We're lucky that the prize includes breakfast, so we'll start the day off with a full stomach. But we may have to pay for dinner, and most dinners are a set price of N$220 (approx $23 Canadian) per person. I'm sure they'll be fantastic meals, but if we use all 25 nights that will add up to over $1,000. We may just have to splurge! It could be that we forego some of our included nights of camping and simply stay in the lodges that are close to some of the campsites. That way we'd be able to go back to the truck and make our own meals for a few of the evenings. As I said, we'll figure it out. It's not a bad problem to have! And, apparently the 25 nights are transferable, so do any of you want to join us for a night or two?? Thank you all...we're so lucky to have some of the most engaging readers on the internet! We can't wait to tell you all about Namibia! We glad to help anytime. Can't wait to read about it. Thanks again so much Carl! We can't wait to write about it for everyone. Ah, we are lucky because we have so many fans and readers that voted for us, remember this contest wasn't like pulling a name from a hat, or winning a lottery ticket on a random draw. We are so looking forward to checking out these lodges and letting everyone know what is out there, hopefully we can entice people to come and visit the country themselves. Pretty easy to do from my chair here. I see they have actual glass in the windows. Probably a good thing, considering the night time activity. Thank you too Bob, we really appreciated your help. Many of these lodges are in places where you don't have to worry about the lions or other dangerous animals so we aren't to worried. This is so cool. You'll figure out the meals. Can't wait. I am sure that we will Chris! I would definately splurge some on the trip. We two deserve it after being so frugal! We will splurge at times Catman but we will still be mindful of where and how we spend it. Another congratulations to a great and industrious couple. You two definitely deserve to win lots of contests. It's been fun entering my votes and I'm thrilled for you both. With the options you have I know you'll make the absolute best adventure possible. And, I love reading the plans as they develop - keep it up. Thank you as well Mary-Pat for all those days of voting, as I have said above, we really appreciate all our help and support. We are having fun planning this and it will keep us busy for a while but we can't wait for the adventure to begin. Would love to join you, but just can't take the time off right now (chuckle). Glad you won, voted daily (thanks for the reminders Ruth!). I'm sure you will work things out for the logistics! Can't wait to read about your travels!!!! We can't wait to start writing about our adventures so that everyone can read them. Thanks Sherry, for us Facebook is a life line to our family and friends, we couldn't do without it and it's been a bonus for us with this trip, that's for sure! For N$220 I would expect a good meal at a good restaurant. If you are not required to eat dinner at the hotel/resort then you will probably find cheaper meal options elsewhere in the town. Generally speaking I expect that you will find Nam and SA to be cheaper in many ways compared to north America. Yes, we are sure that the meals would be top-notch, no question about that! Our problem is, is that many of these lodges are far away from anywhere so there would be no option of going down the street for a cheaper meal but as we said, we will figure out something and if not then we will splurge and just enjoy our time there and the meals. Wow wow wow, brilliant news, reckon if you keep going like this you will never have to return home again ! Wish that we could but then we would miss our families and friends! I had already thought of that Grace, we'll have to wait and see whether that is possible or not. Thanks so much for voting for all those days Grace, we couldn't have done it without you and the rest of our Facebook fans, we really owe you guys! This might be a duplicate.. This guy is in Namibia right now after about a year off travel for illness. He travels the world by sidecar... ubear is how his name is pronounced.. Thank you Garry, we will keep our eyes on this blog, you never know maybe we will even cross paths with him. congrats..yep voted everyday sometimes able to do it twice, you and animal rescue sight that gives food to shelters..so two clicks every morning started my day..
some mentioned going to town for a meal..from the looks of that pic that resort is in the middle of nowhere, dont think town is around the corner. Again we can't say thank you enough for all the help and support. You are right, a lot of these lodges are out in the middle of nowhere so going down the street for a cheaper meal will be out of the question. Having said that, I have no doubt that these meals will be worth every penny, if they were to be bought in Canada they would be way, way more expensive so I know that it will be money well spent. We find that a fine breakfast sets us up for the day! Maybe add a bit of lunch and you won't feel like so much in the evening? The heat may well take the edge off your appetite and if you are like us you will be getting up so early that you feel like bed at 7pm! Just time for a nip of something (alchoholic?) around a camp fire and off to sleep-particularly if you did hitch your tent. Thank you Sft, we feel very fortunate to have so many loyal Facebook fans/readers that were willing to help us out with the voting, we sure are lucky! We are thinking much the same with the breakfast and we will try to make sure that we have as many snacks with us as we can manage to bring but I know that we will still need at least one more decent meal each day. We will just wait and see what happens after the first few lodges and then we will have a better idea of how we can make the most out of our money. Congrats to you! Guess I need to start entering contests. Hope to be in Namibia in March. Thank you Gaelyn. We have always said that you can't win if you don't enter! Too bad that we won't be able to meet up, we will be heading back to the U.S, and Mexico by the beginning of March. Congrates on winning again. Maybe there is a contest out there for free meals during your adventures in Africa. Wouldn't that be a hoot! This is going to be a fun time for us all, can't wait! That would be funny! We can't wait either! Congratulations - that is awesome! That is so exciting. I am so glad you guys won. Just had a crazy thought. If everyone who follows your blog sent in $1.00 we could treat you guys to free meals at the lodges you will be staying at. After the summer you guys just put in it's the least we could do to show our appreciation, and it's only a buck. Lol, yep that would work but I think our readers and fans have already done enough for us. 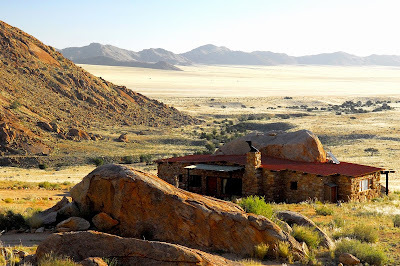 We just hope that we can do an amazing job of bringing this trip/adventure to each and everyone of you through our blog posts, so that you feel like you are in Namibia yourselves. Glad to help to my favorite Blog.